This will be a short review and will mostly reflect my opinion about the device as my test results. My primary reason of interest for the device is using it as an access-point. As written above, this is the first (and currently only) Mikrotik device that has a dual-radio setup of 2.4Ghz and 5.0Ghz AC each with 3 antenna’s attached. 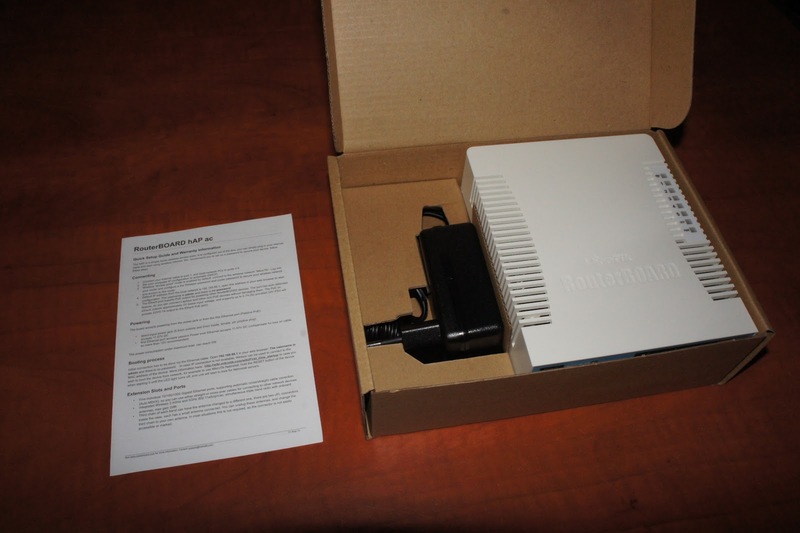 Since I sold my previous access-points a while back (Ubiquiti UAP-ACv1) I have been looking for something new. They performed just fine for the time I had them (quite well actually) but since I enjoy testing out other/new technologies I decided to sell them and either get something new from Mikrotik or from Ubiquiti (Such as the UAP-AC-PRO). Since Mikrotik introduced CAPsMAN a while back I’ve been interested in it. I like the concept of having a central WiFi controller with several access-points spread throughout the house. And I figured the hAP AC would make an ideal candidate for this. In my new house I’m looking to use 3 or 4 ceiling mounted access-points spread out through the house to have good coverage and speeds everywhere! I don’t believe in $300+ consumer WiFi router/firewall/access-points with giant antenna’s located somewhere in the house to deliver WiFi to all the clients you might have, wherever they are. Especially since they now have started introducing $450+ triple-radio access-points with 2 AC radio’s. Complete madness to me and I believe they only sell because consumers think bigger is better, which, with WiFi, is NOT the case. I’d much rather have 3 low power radio access-points spread through the house then have 1 high-power one in the middle. It will give you a much better average throughput rate and better coverage all through the house. Also remember that every WiFi device, big antenna’s or not is limited to the same amount of output power. Yes, a bigger antenna will help you receive signals, but not by as much as you would imagine. 3dB extra on your antenna does not increase your range to double the area. Also, it does not give you ANY higher output range. Because total output power is determined by maximum dB. So you can either use a bigger antenna or send more wattage in an antenna, not do both because it’s capped by law what is allowed. And thus I would much rather have 3 access-points spread over the house which all have low output power to serve the clients near to it and have decent reception back, because the clients they are serving are never far away. Combined they will almost always be able to deliver a much higher performance then one access-point will ever manage. Downsides? I can think of only one, you need to have cables to all the places where you wish to put those access-points. Since I’m building a new house this will not be a problem. Another factor of attaining the maximum amount of transfer speeds possible is your actual radio connection to your access-point. In a perfect world you would always connect at 1300Mbit AC speeds but in reality this is almost never the case. For instance, most laptops are equipped with 2×2 AC wireless cards, not 3×3 AC. From what I know only Apple MacBook Pro’s are equipped with very good Intel 3×3 AC adapters. Most others, having a 2×2 radio, will limit your transfer speed and give you a maximum radio connection speed of 866Mbit. Phones and other small devices most often only have a 1×1 AC radio limiting radio connection speeds to 433Mbit. Next to maximum speeds, more important is what kind of realistic speed you are able to connect to your access-point. Even if you have a 3×3 AC wireless card and decent antenna’s in your laptop, that still does not guarantee you will always be getting the maximum transfer rates possible. Distance, walls, other signals in the same band, bad software or hardware implementations, there is lots of reasons WiFi in the end becomes quite complicated. Whatever you do… never EVER use a wireless repeater. I can’t be more clear then that. A wireless repeater takes an already bad/horrible WiFi signal and rebroadcasts it so that other clients can connect to it. This effectively halves bandwidth and doubles or triples latency. It’s a proven unstable and inconsistent construction and even worse it destroys the whole radio spectrum for you and everyone around you. Bad bad bad. If it’s absolutely and completely impossible to get to an ethernet cable to the place needing better wireless coverage try using an Ethernet-over-Power set to transfer ethernet to it that way. That is still a much better solution then using a wireless repeater and almost always a faster way to do it too. With all that theory out of the way, the hAP AC tests! When I received my hAP AC’s I deployed them in a similar setup as my current Mikrotik N access-points were setup. I’ve been using self built 3×3 5.0Ghz Mikrotik RB912UAG-2HPnD before this. So in theory this gave me 450Mbps of bandwith, in reality this was around 100Mbit to max 150Mbit though. Fairly stable and ok, but not that great as a “cable replacement” what I was using it for in my current home. The results below are pretty good as an improvement over my previous setup but it also immediately highlights the bottleneck of the hAP AC in such a situation. Please remember that these tests where done using conditions which where specifically setup in such a way that it would maximize transfer rates. That means access-points close together, no other clients connected, etc. And there you have it! In a maximum performance setup connecting two hAP AC’s together their maximum transfer rate is about 500Mbit because of CPU limitations. Weirdly enough, the CPU usage between upload or download on an hAP AC shows a very different amount of CPU usage. I’m not sure if this is by design or something in RouterOS causing it. Ok, that means that with the current software, the hAP AC will never be able to achieve it’s 3×3 AC radio maximum a 1300Mbit link would allow for. Realistically and the highest I’ve ever seen in a review that would result in a transfer of about ~700Mbit / 87,50MB/sec. So the hAP AC is not that far off but still, strictly speaking it is CPU limited. I believe those results to be good for what the hAP AC is. 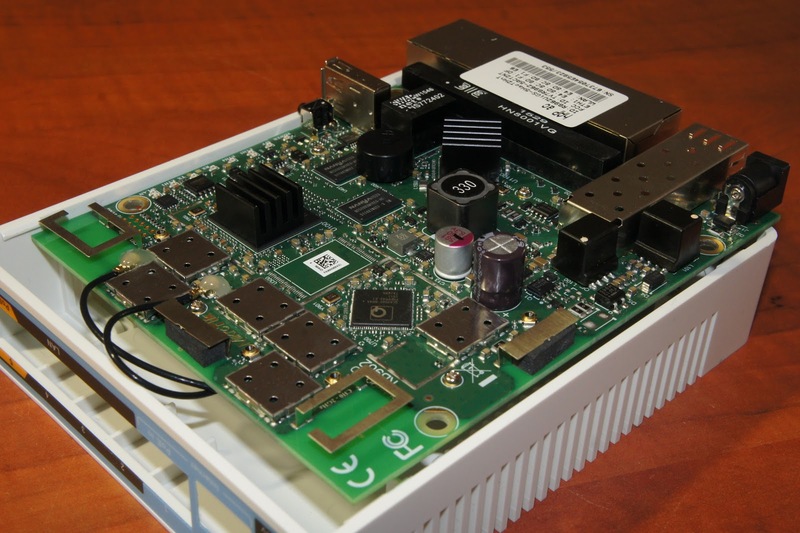 Is the hAP AC the best AC access-point the world has ever seen? No, certainly not. I would call it average to good, leaning to good. I believe it will only become excellent for me when I take the price, RouterOS, continued upgrades and CAPsMAN into the equation. Your situation might differ though! As I stated above, I will be using it mainly in a multiple access-point deployment situation. In such a case, not being able to hit the absolute maximum in performance is compensated by having multiple access-points which can handle clients at the same time literally doubling or tripling your potential throughput. I know, I know, it doesn’t actually work that way. They will be in different area’s and not servering the same client. That doesn’t seem to stop some vendors with indoctrinating their consumers with it though. If I would follow the rules vendors use on their packaging with 4 access-points that would be 7000Mbit wireless! Of course it doesn’t work that way but that doesn’t stop them from shouting those numbers it would seem? Like this giant 8 antenna spider access-point. I’m sure it’s a great access-point, but AC5300? Nope, one client can still only connect to one radio. And how do you uplink this beast? 2 cables? My 4 access-points would have 4 separate dedicated Gigabit links, that’s more then double the bandwidth! Muhahaha. No, but seriously. That Asus costs 450 euro! That’s enough to buy 3 hAP AC’s! I’m not saying it’s a bad access-point, just more often then not, not the right solution. When testing further using the same setup and with different clients I believe the radio and antenna’s in the hAP AC to be fair. It’s using 2dB internal antenna’s which isn’t bad, but also not the best. Again, in my case this will be fine because I plan on using multiple access-points spread out through the house, but if you where looking at a single hAP AC to provide coverage for your whole 2 story house, it might not be the best access-point for you. I believe it will do it, but further away and through some walls you won’t be achieving record braking speeds anymore and even further away some blackout spots may occur. In the end I want to use CAPsMAN to manage my hAP AC’s so that was the next test I did. There is two modes you can run your CAPsMAN access-points. Local breakout or tunneling all your traffic to your CAPsMAN controller (A CCR1009 in my case) and breaking it out there. For me, the last variant is the most desirable. I will have multiple SSID’s and breaking them all out locally will involve running VLAN’s over the network and bridging all those together on the separate access-points. With central breakout all the traffic of the access-points will be tunneled to the central CAPsMAN controller and broken out there. Much easier to manage! But, there is a downside to using the tunneled central breakout method, higher CPU load. In testing using CAPsMAN lowered the attainable transfer speed to about ~300Mbit of actual throughput before running into a CPU limit on the hAP AC. On a funny note, it actually depends on which way the traffic is going, uploading from your client to the hAP AC is actually going to be faster up to about ~380Mbit because it’s a lower CPU load on the hAP AC. You need to decide for yourself if you are going to accept the lowered maximum transfer rate or not. Other then the maximum transfer rated being capped by the central breakout mode it has performed very well the last two days I’ve been using it as my “production” access-point in my home! It hasn’t dropped a ping yet, latency is great and all my devices are connected to it without issue. Transfer rates are a lot faster then my N access-points before (even 5.0Ghz one’s) and the CPU mostly isn’t my bottleneck but the radio connection is. I’m pretty happy with it! I haven’t gotten around to testing the hAP AC in local breakout mode yet. I will be doing so soon and update this review. 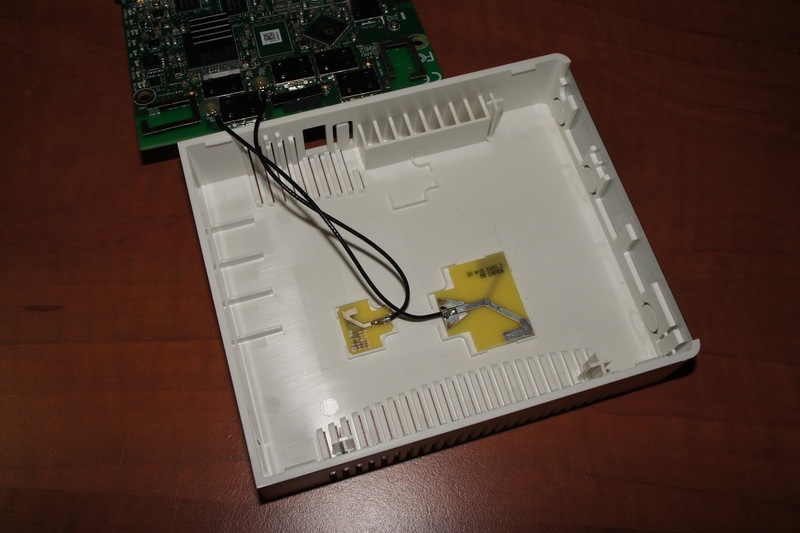 All of what I’ve written before has been about using the hAP AC as a dedicated access-point. 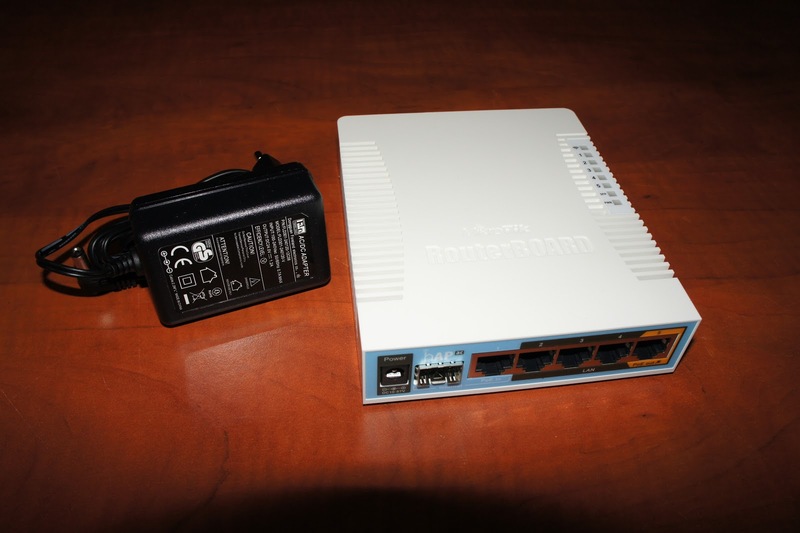 Of course, as with any Mikrotik Routerboard/RouterOS device you have the full power of RouterOS available. It does have 5 Gigabit ethernet ports! Although the hAP AC will do both functions (router/firewall and access-point) without any issues technically as we learned above using it as an access-point only the CPU will become even more of an issue. I believe you will probably be fine with some simple firewall rules and internet connections up to 200Mbit and getting those speeds over AC WiFi. Anything more then that and the CPU will probably become your limiting factor again. More about this when I’m able to do some tests. I did some cabled tests to my own network to see what kind of performance the hAP AC can give you while using it as your router/gateway AND access-point at the same time. First the cabled tests, although it was configured as an access-point also, it did not have any clients connected. As you can see, without Fasttrack the hAP AC is capable of almost routing and NAT’ting a Gigabit in software mode. The more connections I created the slower it got because the CPU was the limiting factor. Next are the same tests but with Fasttrack enabled. The rest of the settings are exactly the same. Fasttrack makes a noticeable difference in maximum throughput performance. It can now sustain a Gigabit routed and NAT’ted without topping out the CPU. It can probably handle some rules with it. Next I took another hAP AC, put it into pseudobridge mode and connected it using wireless to the hAP AC doing all the other tasks. In theory this is comparable as having a client connect to the access-point. Well that is surprising? Even while routing and doing NAT the hAP AC remains exactly as fast as not doing those tasks! Either some parts of the software still need to be fixed or it just works because of fasttrack, I don’t know right now. It just does surprisingly well doing both tasks at the same time. In doing some tests I judge idle wattage to be around 3 to 4 watt. The max power usage I don’t know yet, but the data given is confusing Routerboard.com states max 17 watt while the little paper included with the hAP AC in the box says 5 watt. I’m inclined to believe the max 17 watt because the adapter that comes with it is a 24v 1.2A one, that equates to 28.8 watt. 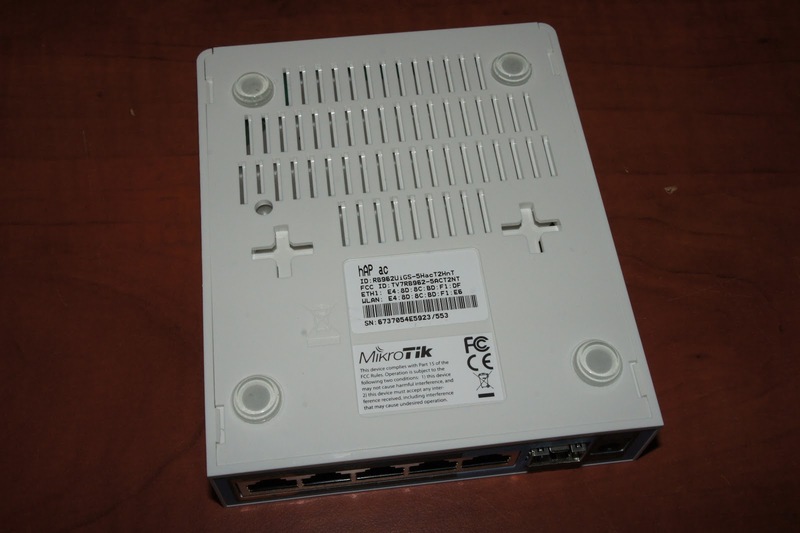 Mikrotik also uses 24v 0.8A (19.2 watt) and 24v 0.38A (9.12 watt) adapters. If the stated 5 watt would be correct, they would have included a lower amperage adapter so I’m thinking 17 watt is the correct max value. I believe the hAP AC does pretty good as an access-point. Yes there is better to be had, but those will also cost (a lot) more. The closest competitor that I know of would be the Ubiquiti UAP-AC-PRO. That one is a little bit more expensive though and has had it’s own share of throughput issues (With only recent alpha firmware raising the max throughput of ~500MBit to around ~600Mbit). 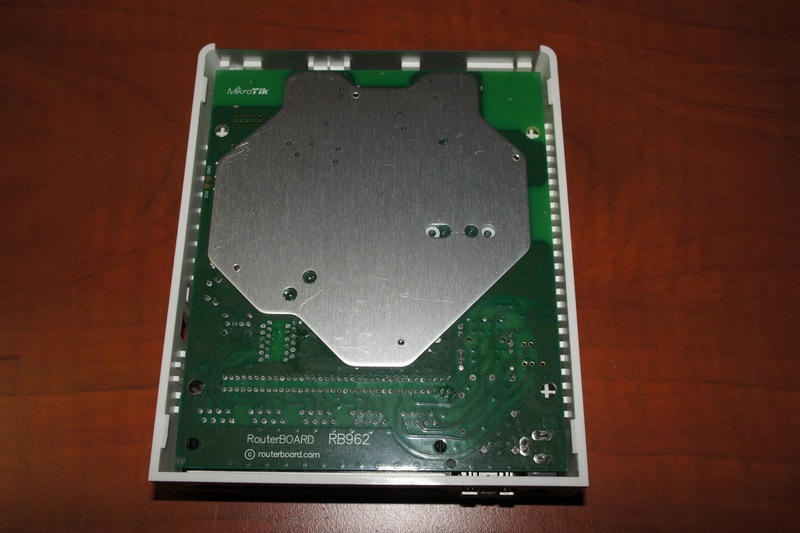 Who knows that might also happen with the hAP AC later on since it’s based around practically the same hardware. Surprisingly it also does very well combining the role of a router/firewall and access-point together. No slowdown was seen even when downloading over wireless going through NAT! Very surprising but the numbers don’t lie. If you have an internet connection with a max of 300Mbit or even a little bit more (Up to 500Mbit?) it will actually do quite well it seems! 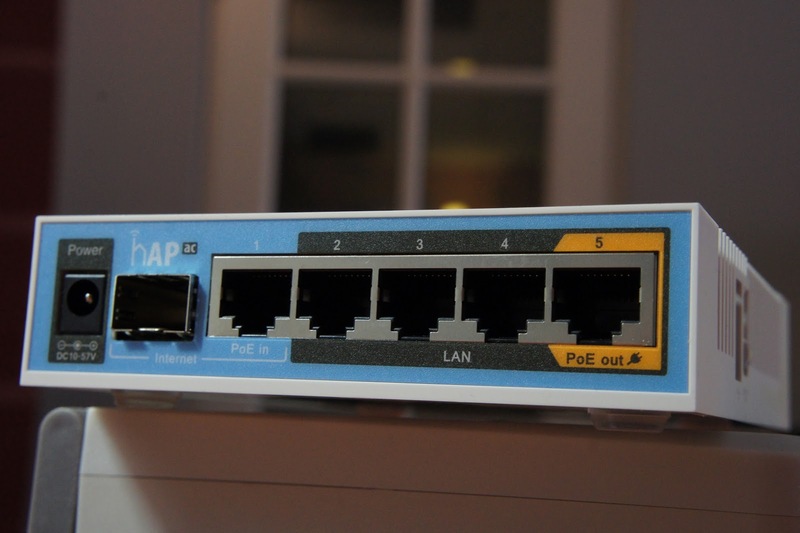 I suspect Mikrotik will be introducing a wAP AC and cAP AC soon being the same hardware in a different form factor to further their line of access-points to be used with CAPsMAN. If you wish to mount the current hAP AC on the ceiling or wall you could use an RFelements Stationbox Spot hiding all the LEDs, cable and providing a bit cleaner look. But all in all I’m happy with the little device. It does very well for it’s price and it’s been perfectly stable for me which is also a very important factor. No sudden disconnects, ping drops or broken connections. A perfect setup for a larger home and all managed using my central CCR1009! Interesting article, which queue type you use? Wouldn't hardware queue increase speed by lowering cpu utilization? I don't believe that is the case. I tried it anyway and changing the queue for the WLAN cards from "wireless-default" to "only-hardware-queue" sadly did nothing for the transfer rates or the CPU utilization. great review. could you also test VPN performance ( OpenVPN and IPsec ) ?? Nice review. You're the Boss. As you might be aware, ipv6 fast track is not supported. Can you do a wireless ipv6 iperf3 routing test with connection tracking in firewall. I surprise how so much effort you put to create the sort of wonderful informative site. Replied to you in your thread, think it’s actually doing ok, but you might need to use slightly different test settings. Just curious will you be using WDS to link the routers together or which configuration will you be using to setup the MESH? No, I’ll be running them cabled so using CAPsMAN (Mikrotik Wireless controller) while having each uplinked with their own Gigabit port. MESH, WDS, etc. are all last resort solutions in my opinion, if you can use an ethernet cable, you really should, it’s definitely worth the effort! Thank you for the review, could you please confirm that how much RAM does it has? As I see in the board pics, it has two Nanya NT5TU32M16EG-AC chips. If I understand right, it would make 64MB RAM. But in the spec, Mik says it has 128MB. Great writeup. It helped me decide to go for ordering some of my own MikroTik hardware! I just received my first set of hAP AC’s. I want to setup one of them as an access point w/vlans, and use the other as a full router/ap/gateway/firewall. I’m completely new to MikroTik, I’m wondering if I could query some info to help me get my setup working? That’s going to be difficult. I am thinking about making some Mikrotik tutorial vids/articles though, thnx for letting me know! Hello. Do i have to use WDS if i setup CAPsMan? Some thoughts about your power consumption review. May be also the possible POE connected devices impact the power supply size. If I find the time I’ll try to do some updated measurements, but I don’t think it’s going to change much real-life since signal quality will always be more of a slow down then the far out of reach CPU bottleneck only in the most ideal situation possible. Awesome review, thank you very much! Depending on the configuration, if you are using the APs in tunneled mode, it’s the encryption and tunneling causing the issue. If you are using local break-out or non-CAPSman there really isn’t an issue with speed? As I demonstrated in my results you need an unrealistic scenario to begin with to get the maximum speed out of these AP’s, at those speeds the CPU does get loaded but still, in normal scenarios that will never be the issue. 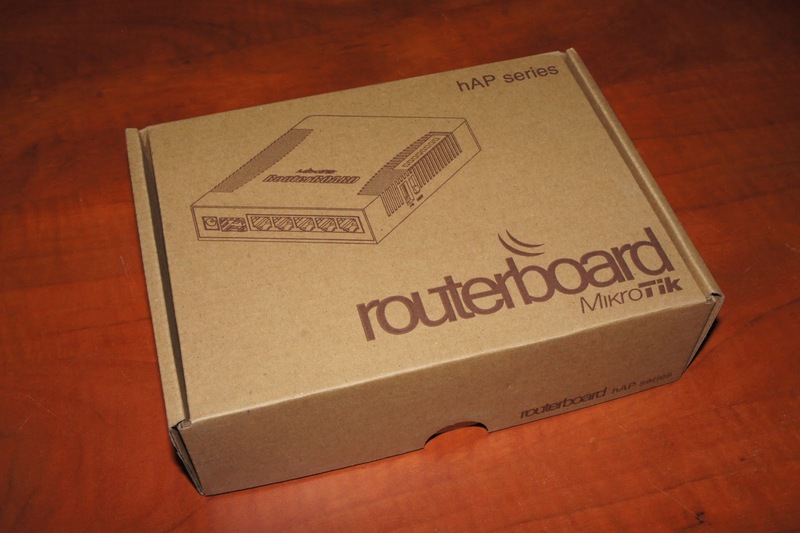 Hi, can you do a comprehensive review on Mikrotik hAp ac2? I am greener than the fields in Ireland on this sort of topic. 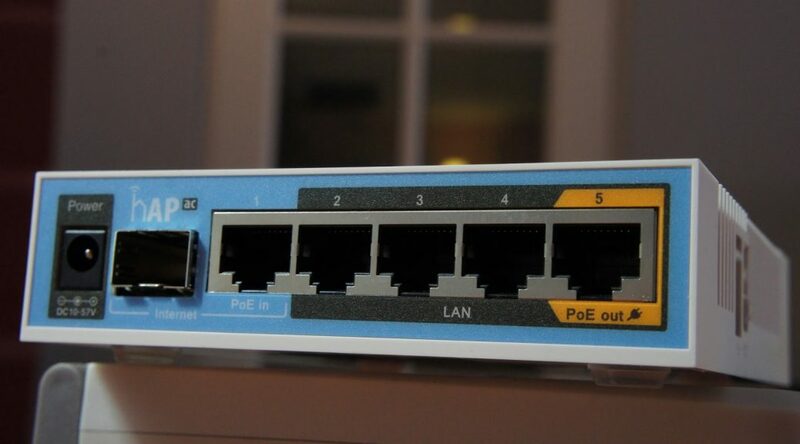 Is there a website that explains in detail how to connect a Mikrotik hap ac lite router to nordvpn. Is that sfp cage supports 10G connection. There is nothing on the internet mentioning its speed.Though, Mikrotik sfp compatibillity list shows its support 10G sfp modules. What? No, a hAP AC has an SFP port not an SFP+ port, so it’s 1Gbit only!